Now pay attention because this is the best story. 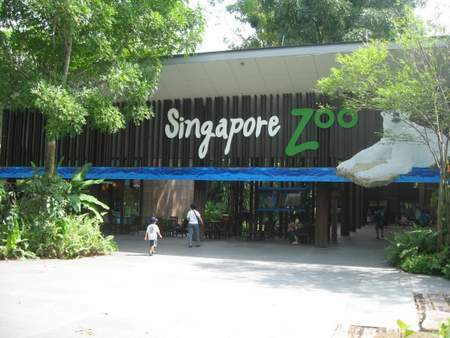 One hot and sticky night in Singapore, the last human visitors had left the famous Night Safari and all the animals were awake. Petite tarsiers munched ferociously on fresh grasshoppers. Plump capybaras scurried about their enclosure making sure that the wolves next door had not found a way through. And occasionally the terrifying saw-tooth roar of the Malayan tiger ripped through the black night and crossed McRitchie Reservoir to chill the blood of Singaporeans eating dinner in open-air food courts. Next door in the Singapore Zoo the only noise that could be heard was contented snoring. The seals, orangutans, kangaroos, baboons, pelicans and penguins were all asleep. The rides in the children’s playground were still. And the normally bustling pathways were deserted. But Sheba and Inuka, the two polar bears, were not asleep. Instead they sat upright on their hind legs, alert and staring silently through the open doorway to their den. This evening their keeper had delivered dinner as normal. However, just before locking the door to their specially air conditioned enclosure, he had been called to help with an emergency (an otter had escaped and was last seen heading for the aquarium building). And he had never returned. Slowly Sheba stood up, shuffled a few steps and poked her big white head out. Nothing moved. She took a long, deep breath. A humid cocktail of strange, delicious smells flooded her nose. She looked back towards her son and signaled that it was safe. Then the two polar bears walked out to explore Singapore. They walked noiselessly through the zoo, passing the enclosures of neighbors that they had heard so many times but never seen. All were asleep apart from an orangutan who opened one eye, smiled and dozed off. Soon they reached the shore of McRitchie Reservoir. The waters were black and tranquil and for a while the two bears stared at their crystalline reflections. Then they slipped into the inky liquid and starting swimming towards the lights. Polar bears are very strong swimmers and so, after about an hour, Sheba and Inuka reached the other side. They hunched down low in the water beneath a palm tree and looked to all intents and purposes like two large rocks that had been there as long as Singapore itself. And, as the warm water lapped gently around them, they watched. They watched crowds of excited people darting like tropical fish in and out of coral color shops. They watched plates of spicy noodles, crabs, dumplings and curry swirling out from steaming kitchens and onto open air tables. They watched illuminated elevators soaring up the sides of sleek mountains of glass, metal and stone. And they waited. They waited until all the shops had closed, the food courts were empty and the elevators were still. And then the two polar bears slowly emerged from the water and ambled down Orchard Road. Orchard Road was once, as the name suggests, a tranquil lane through lush plantations of nutmeg, pepper and tropical fruit. Over time large residences for the rich merchants of Singapore, colonial administrators and the sultans of nearby lands were built on the surrounding hillsides. Then, about 50 years ago, shops started to appear. At first just small family run shops selling knickknacks to people travelling between home and work in the plantations. Then bigger supermarkets and furniture shops visited at weekends by Singaporeans who worked in shipping, electronics or tropical fish. And nowadays the former quiet country lane is a one mile carnival of shopping malls, bustling cafes, sophisticated boutiques and slick marble office towers. By day, throngs of shoppers and office workers competing for handbags and cappuccinos. And by night, a flotilla of blue taxis ferrying colleagues and couples between bars, restaurants and cinemas. Sheba and Inuka padded noiselessly along the sidewalk. They strolled by the Isetan, dodging between the shadows of palm trees to avoid being spotted by the guards. They passed in front of the serene Thai Embassy, had a swim in the outdoor pool at the Mandarin Oriental Hotel and played ‘catch the penguin’ in the skateboard park. Once or twice a human came walking towards them, but did not see the huge bears frozen still against snow white concrete. Then, as the first reddish signs of a new day started to show in the sky, they stopped to look for somewhere to rest and eat. The bears were hot, hungry and thirsty. Behind them was a huge pink marble shopping mall and from within they could smell food. Inuka walked over to the main entrance, stood up on his hind legs and put his dinner plate-sized paws against the centre where two glass doors met. There was a gentle clunk as the lock gave way. And then Sheba and Inuka scurried into Ngee Ann City. The food court was in the basement. The two bears tumbled down the stairs, skidded across the marble floor and burst into the main seating area. All around them were individual stalls that normally sold the multitude of dishes that Singapore is so famous for. The bears soon worked out how to open the fridges and cupboards in each stall and within half an hour they had polished off numerous pots of spicy seafood curry, chili chicken stew, red beef rendang, prawn noodles and skewers of pork satay. Then they had red rubies for desert and washed it all down with a couple of liters of soya bean milk. Next they needed somewhere to rest and hide. Instinctively they wandered upstairs and stopped in front of the huge fountain. It was silent and still now but during the day plumes of water rose many meters into the air and rivers gushed from gaping vents into the large pool below. Sheba and Inuka climbed into the fountain and swam towards the back. There they found a wide ledge that was dry and hidden from view. And so, in the middle of the biggest shopping mall in Singapore, the two polar bears fell asleep. “Polar bears missing!” exclaimed the front page of the Straits Times newspaper the next morning. And by lunchtime the possible whereabouts of Sheba and Inuka was the only topic of conversation throughout all of Singapore. Zoo officials appeared on television and explained that the bears were familiar with people and not dangerous – but members of the public should call the police rather than approach them. Searches were conducted in the CBD, NTU, HDB’s and on the MRT. An experienced tracker was brought in from Borneo to help. But not a trace. Soon the two polar bears missing in the tropics were on the news all around the world. And as the days passed speculation grew. Where were they? Had they disappeared into the jungle and gone native with the monkeys and monitor lizards? Were they somewhere in the Indian Ocean swimming slowly towards the North Pole? Meanwhile, blissfully unaware of the commotion they had caused, Sheba and Inuka spent their days sleeping in the fountain at Ngee Ann City and their nights exploring the labyrinthine marble hallways of the huge shopping complex. Each evening, when the last shoppers and office works had left, they emerged and went down to the food court for dinner. Both bears had developed quite a taste for spicy Singapore food and they devoured pots of Malay, Chinese and Indian specialties and all the fusions in between. Then, after dinner, they went window shopping, rode the elevators, played in the children’s area, visited one of the exhibitions in the basement or sat by a window and quietly looked out at the world. Occasionally, a security guard would come wandering by and the two bears would quickly slip away or hide (although the singing security guard must have suspected something because he always left some fresh fish on a plate in front of the Tiffany store). However, after about a week, Sheba and Inuka awoke one night and felt something they had never felt before. It was a strange but somehow familiar feeling. Their muscles ached, their teeth chattered and shivers ran through their bulky bodies. They were cold! The air conditioning had been turned up so high that even polar bears found it chilly! The two bears stomped their feet and shook their heads. They guzzled hot and spicy curry. But it was no use. Singaporeans adore frigidly cool shopping malls and offices (so much so that you can buy special coats in Singapore… to wear indoors) and whatever Sheba and Inuka tried they could not warm up. So, the two polar bears waited until everything was quiet and then they slipped out of the front entrance to Ngee Ann City, hurried along Orchard Road, swam across McRitchie Reservoir, sauntered through the quiet grounds of the zoo and walked back through the open door into their home. Are you wondering why the title of this story is about green polar bears? Well, if you go to the Singapore zoo and take a look at Sheba and Inuka you’ll notice that they do have slightly green coats. And this is because they got to like spicy food so much during their stay in Ngee Ann City that they now get a bucket of curried fish every day – and it makes their fur go green!